Not too long ago I took this photo of our dog, Otis. He was looking way too cute not to take the photo. So, of course he looks cute and you could just look at those big brown eyes as adoringly as he’s looking at you. But is there more to this photo? Ready to chase a bee or a gnat at a moment’s notice. I think living in our Insta-everything world has helped us record more, but also helped us not record enough. We are capturing moments more than ever, which is fantastic, but are we getting the whole story? A good chunk of the time, I think not. I also think it happens in scrapbooking. We are good to get the date and a title and maybe a line of journaling, but what’s the story behind the photo? It’s those details that capture a greater slice of life. Here’s what you don’t know about this moment. We were sitting out front on a fresh spring evening when the weather had finally started to warm up a bit. I was sucking in as much fresh air as I possibly could while sitting on my tan plastic adirondak Home Depot chair with my computer on my lap. I was missing The Amazing Race, one of the few shows I watch, and I didn’t even care. We have to tether Otis to a tree so he won’t run off–or chase the much-despised-by-all–dogs dog that frequents a walk with its masters on most evenings. He had just been jumping around trying eat a bee and gnats. Even though he’s five (that’s 35 in dog years) and as big as a horse, he still acts like a puppy and is all cute when he’s playful like that. 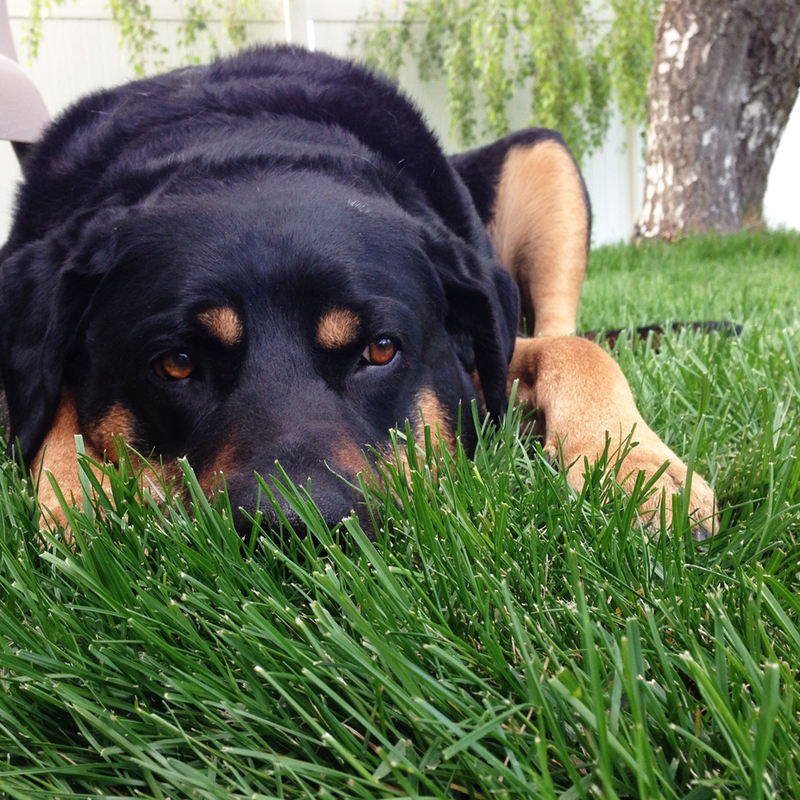 Being a lab-rottweiler mix, he has that hound dog in him and loves sniffing everything, including this evening, except he was digging his nose into the grass trying to sniff something out. It was rather funny to watch him do this. As he finished his intense sniffing, he hunkered down right to the left of my legs looking just like that. Looking so danged cute, I knew a photo needed to be taken. Getting up to get the shot I wanted was not an option because he would have followed me and I would have lost the moment. I knew I wanted a ground shot so I could get him nose-deep in grass, so while sitting in my chair, I grabbed my phone, turned the camera on, and positioned it down on the grass under my leg–not really being able to see the shot I was taking and hoping for the best before he realized a camera was on him and moved…as he usually does, the stinker. How does he know?? While the Insta-tagline was cute and fun, it captured just an insta-moment and the whole story is so much better. So the next time you sit down to document your photos, think about all the little things and include adjectives to describe that moment in greater detail. And here I was totally envisioning you getting down on your belly in the grass to capture this shot! Great story behind the photo!! Such a wonderful picture that you will cherish for a long time and such great memories from this moment! Fabulous story, just as the picture. I loved both!! !